The Guardian posted an interesting piece yesterday - Idris Elba defends Thor film role. Idris Elba is a respected British actor who played Stringer Bell on TV's The Wire. 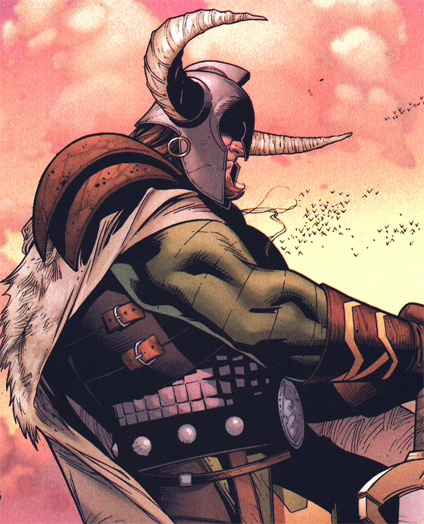 He's playing the Norse god Heimdall in Kenneth Branagh's upcoming film adaptation of the comic book Thor. He also happens to be black. The subheading of the article was "Race debate stirs after London-born star of The Wire wins role as Norse deity Heimdall in Kenneth Branagh's new film Thor." "I am sick of white characters being changed into black characters. Call me racist all you want but if a black character was changed into a white character people would go nuts!! I agree with the top posters, lets have a white Blank Panther. ... Would black people mind if someone casted a white person to play Luke Cage? ... Then why is it alright to screw with other Superheroes that were white from day one? Apparently it doesn't matter if your white. Now that is racism at it's best!" This post was wrong on so many levels. The fact that the overwhelming number of superheroes "were white from day one" is not some untouchable foundation without which the superhero universe will crumble. Many superheroes were created in the early- and mid-twentieth century, when white males were severely overrepresented in every medium. Slowly they introduced female superheroes (Wonder Woman), handicapped (Professor Xavier, Daredevil), even children (Supergirl, Robin) but only recently have there been any decent minority superheroes, and even then most have been quite minor. Heimdall is not a major character either, so it really isn't such a big deal. I doubt the angry fans would denounce the comic creators as white supremacists for portraying the superhero universe as a whites-only realm. And they don't seem to have a problem with Hollywood being a predominantly white world either (although that's changing, but at a snail's pace). When they finally do see racism, it's when someone takes ever so small steps to address the decades of racial inequity. Calling this "racism at it's [sic] best" is rich. It brings to mind all the reactionary talk-radio types like Glenn Beck and Rush Limbaugh who never manage to see racism when it's directed at people of colour, yet happily toss the term around when a white person gets to play victim. Hence Beck's absurd and self-contradictory claims that Obama has "a deep-seated hatred for white people or the white culture," followed by "I'm not saying that he doesn't like white people. I'm saying he has a problem," and finally, "this guy is, I believe, a racist." No Mr. Beck, you are a racist. As for the claim that "if a black character was changed into a white character people would go nuts" that happens all the time, even in our day and age. Angelina Jolie alone has been twice cast to play a black woman -- the fictional character Fox in the comic adaptation Wanted, and Mariane Pearl in A Mighty Heart. Other races get whitewashed too. Jennifer Connelly played the Latina Alicia Nash in A Beautiful Mind. And there are tons of roles that should be cast as Asian but go to white folks, like Harrison Ford as the real-life Asian researcher Dr. Yuan-Tsong Chen from Extraordinary Measures, or pretty much the entire cast of 21 and The Last Airbender. Just a couple of hours before the Guardian posted the item about Idris Elba, it posted another piece about Mickey Rourke being cast to play Genghis Khan in an upcoming film by John Milius. There was no subheading about a race debate, mention of its inappropriateness or any quotes from angry fans. The fact is that the film and television world still sees white men as the default setting, and doesn't like to open up casting unless there's a "reason." I'm reminded of when Eric Byler was pitching his film Charlotte Sometimes around L.A., telling studio execs that he wanted to make a love story with Asians but no hookers or martial arts. He said that they all responded, "then why do they have to be Asian?" Because, of course, you know the only Asians out there are hookers or martial artists. Sadly, that type of thinking still persists. That's why all minorities (but especially Asians) are incredibly underrepresented in film and television. And when you do see them, they're generally stereotypes and in smaller roles. I almost never see someone like myself, someone who was born here and is really just the same as everyone else. It isn't automatically "racist" to cast someone who is not the expected race. It can be done in different ways for different reasons. In our modern times where populations of so many countries are quite mixed, continuing to cast white people for every situation is simply an act of cowardice. It takes bravery, but also just plain decency, to see that we live in a diverse world and that people are more than a stereotype. Casting minorities when it isn't necessary but moves a film closer to our present reality is a good thing. So kudos to Kenneth Branagh for making the bold choice of Idris Elba for his adaptation of Thor. You may remember that Branagh was the one who cast Denzel Washington as the brother of Keanu Reeves in Much Ado About Nothing. Washington is of course a two-time Academy Award winner, so if anything Reeves was the token. When minorites end up dominating the screens, then maybe I'll have some sympathy. But until then, those who are crying "racist" at the casting of Idris Elba as Heimdall need to look in the mirror. I guess that the only way to protest is to not go to this kind of movies. It's not that we are racists, but to us white people the white people are more atractive, we can relate more with them. That's way we want to see them on screen. If Hollywood wants to show us only stupid movies with stupid stories, lots of explosion and special effects and as many cliches as they can, they should also get the most atractive people on the screen. When I thought we (comic book fandom) were going to have a serious discussion on representation of race in comics, I thought we were going to have a serious discussion on how hyperwhite characters are. Judging by that link you provided, the lolz were on people like me. That's really sad. Comics are for sad geeks anyway, and the Thor comic was already 'casting' badly in the first place. Thor is a big burly red-bearded type in the authentic tradition. But actually casting somebody with roots from a distant continent is taking the piss when it's an actual GOD of our Germanic ancestors he's playing. Have a Chinese Batman - I wouldn't give a toss. But casting a Swede in the role of some figure from Australian Aboriginal culture would immediately be decried. Ah well, mainstream media and double standards... Yawn.